After having performed in various Italian cities and in Dresden, on 20 April 1785 the Roman tenor Vincenzo Calvesi appeared for the first time on the stage of Vienna's Burgtheater. He sang the role of Sandrino in Paisiello's opera Il re Teodoro in Venezia. Two days earlier his wife Teresa had sung Baronessa Doralice in Guglielmi's Le vicende d'amore. Vincenzo Calvesi was one of the best and most popular lyric tenors of his time. Several contemporaries praised his exquisit singing. Count Zinzendorf, who in 1779 heard Calvesi perform in Trieste in Salieri's La scuola de' gelosi, wrote: "The mezzo carattere Calvesi enchanted everyone in the aria 'A me parche il mondo sia' [...] Calvesi has a silvery tenor voice, and he enunciates with astonishing clarity." One of Calvesi's Viennese admirers wrote: "Calvesi is certainly one of Italy's best tenors, who combines with a voice that is naturally sweet, pleasant, and sonorous [une voix naturellement douce, agréable et sonore] a technique that, without being too refined and studied, cannot but please our audience." Except for a one-year engagement in Naples in 1788/89 Calvesi sang in Vienna for nine years. He earned praise for his interpretation of mezzo-carattere roles in operas such as Martín y Soler's L'arbore di Diana and Salieri's Axur, re d'Ormus and also took part in several performances of oratorios (such as Dittersdorf's Ester or Kozeluch's Moisè in Egitto) for the benefit of the Tonkünstler-Sozietät. The climax of his artistic career – and his earning immortality – came in 1790, when he created the role of Ferrando in Mozart's Così fan tutte. 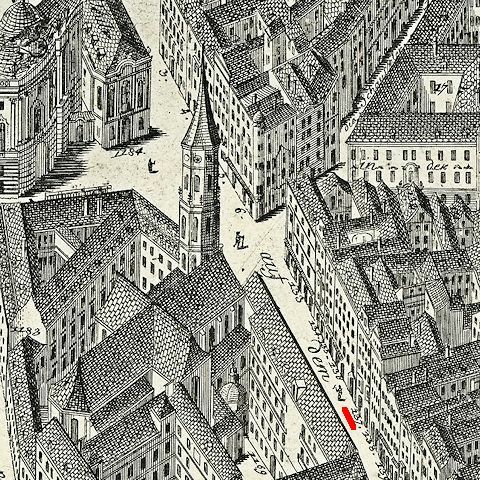 The house Stadt 137 on the Kohlmarkt at the lower right. 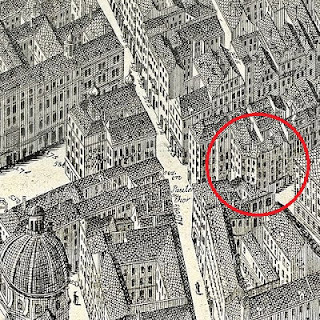 At the upper left is the Burgtheater, in the center the tower of St. Michael's. 24. [August] Der ho[c]hEdelgebohrne H[err] Joseph / v[on] Kalvesi Operist am k k. Thea / ter, gebürthig von Rom. des / Bernard v. Calvesi päbstlichen / Kamerdieners, und Anna Maria / ux. [oris] gebohrnen Petrelli beider / lebender ehl. [icher] Sohn. The honorable and noble Mr. Joseph von Kalvesi opera singer at the imperial and royal theater, born in Rome, legitimate son of Bernard von Calvesi, papal chamberlain and his wife Maria Anna née Petrelli. Test. [is] Sp[o]nsi / Joseph Weiß mp / Reg[ierun]gs Sekretär / und Ober Polizeÿ / Directors Adj[unct] / M[atthäus] Jos[eph] Kuppitsch mp / der Rechte Doctor / auch Hof und G[eric]hts / Advokat. Ms. Anna Sensen Baroness von Seltenhof, born in Jičín in Bohemia, legitimate daughter of Ferdinand Sensen von Seltenhof and his wife Theresia Anna née von Schimeck, both alive. Witness of the groom: Joseph Weiß, government secretary and assistant of the head of the police, Matthäus Joseph Kuppitsch, Doctor of Law and advocate. 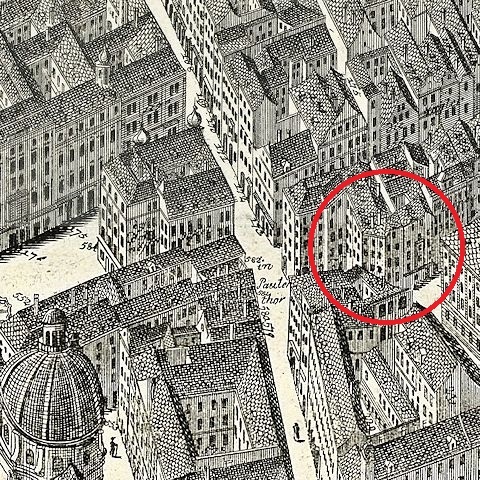 Giuseppe Calvesi lived in the house Stadt 226 (torn down in 1901, today part of Bognergasse 1) which belonged to the pewterer Judas Thaddäus Ribola whose workshop – contrary to information sometimes given in the Mozart literature – in 1791 was not located "close to Count Deym's art gallery". Thaddäus Ribola's house No. 226 in the Bognergasse. 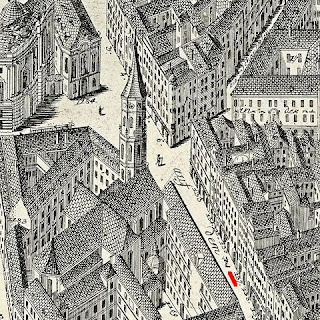 Part of the Graben and the cupola of St. Peter's can be seen on the left. Since Giuseppe Calvesi was not yet in Vienna in 1788, his name does not appear in the Josephinische Steuerfassion (the 1787/88 municipal tax register). We can presume that Giuseppe was born in Rome around 1763 and baptized at St. Peter's Basilica. 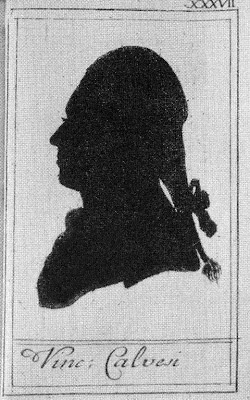 Anna von Seltenhof was the daughter of a member of the Austrian military, cavalry captain Ferdinand von Seltenhof, who in 1780 is listed as a member of the Prague freemason lodge "Zum grünen Löwen". By 1785 Seltenhof had already moved to Vienna, because his son Carl von Seltenhof, who in the 1820s was employed at the Bergwesensadministrationscasse (the treasury of the mining administration), was born there on 14 November 1785. On 11 June 1800 Baron Ferdinand von Seltenhof substituted Count Carl von Esterházy as best man at the wedding of Joseph Karl Rosenbaum to the singer Therese Gassmann. At the time of her marriage, Anna von Seltenhof lived in the house No. 1120 on the Graben that belonged to Franz von Mack (1730-1807), Court jeweller and owner of Kalksburg, Mauer and Speising. Calvesi's best man was Joseph Weiß (b. 1750) who at that time was the secretary of the head of the Viennese police, Franz Anton Beer. Weiß's acquaintance with Giuseppe Calvesi may have been related to the fact that – like Mozart – Weiß was a member of the lodge "Zur neugekrönten Hoffnung" ("New-Crowned Hope"). Weiß was appointed Regierungsrath in 1791 and died "Oberpolizeydirektor" (head of the police) on 23 November 1794. Joseph Weiß's seal and signature from 30 March 1790. The seal is black because Emperor Joseph II had died shortly before. The bride's witness Dr. Matthäus Joseph Kuppitsch (b. Ljubljana 1755, d. Vienna, 1 February 1817) was the father of Matthäus Balthasar Kuppitsch (1796-1849), the founder of a well-known and still extant Viennese bookshop. (That this shop was established in 1789 is a well-intended myth which I have recently refuted). Two weeks after his wedding Giuseppe Calvesi appeared as Biscroma in a performance of Axur, re d'Ormus at the Burgtheater, together with his elder brother. In 1790 Giuseppe left Vienna for an engagement in Moscow. His wife seems to have accompanied him. On 17 January 1798 her name turns up again in an official announcement in the Posttägliche Anzeigen in the Wiener Zeitung, regarding a lawsuit that had been filed by the Viennese tradesman Abraham Hierschel whom Anna Calvesi owed 450 Gulden plus interest and legal fees. She was summoned to a hearing at court which was scheduled for 27 February 1798 and was informed that "in case of her non-appearance at court she would only have to blame herself for the legal consequences." The summons of Anna Calvesi "gebohrne Baronin v. Seltenhof" in the Wiener Zeitung of 17 January 1798. Owing to incompetence of the staff of the ONB, who digitized incomplete copies of the Wiener Zeitung, this entry is not available online. It seems that Anna Calvesi had left the Austrian monarchy for good and did not show up in court. The files pertaining to this lawsuit are not preserved in the holdings of the civil court of the Vienna Magistrate. Vincenzo Calvesi remained in Vienna and continued to perform there. On 9 March 1793 he took part in a concert at the Kärntnertortheater for the benefit of Francesco Bussani and his wife. At the same time he submitted a petition to the court to be kept as primo tenore at the opera, supposedly revoking his own declared intention to leave Vienna in spring 1794. But it was already too late. The court had already reengaged Domenico Mombelli and Giuseppe Viganoni for the following seasons. In 1794 the Emperor even denied Calvesi the permission to give a concert for his own benefit. Calvesi retired from the stage, went back to Rome and became an opera impresario. Together with Bussani he leased the Teatro Alibert from 1796 until 1805. Until 1811 he was a member of a consortium that ran several theaters in Rome with varying financial success. Like many other singers, who had entered immortality by simply creating a role in one of Mozart's great operas, at some time he simply disappeared from the attention of his contemporaries and the date of his death is still unknown. Of course there is still a lot of research to be done regarding the biographies of Mozart's singers. But this cannot be the purpose of a short blogpost. © Dr. Michael Lorenz 2013. Wonderful work, as usual. Dorothea Link has published a very interesting book about Calvesi (mostly about his singing), but this is a pleasure to learn more about the day to day life of these people. There is no *book* about Calvesi by Link. She published a collection of "Arias for Vincenzo Calvesi" with an introduction. That's it. Thanks much. Several recent publications on opera of the period mix-up Giuseppe with Vincenzo.